Then, with good systems in place, you can enjoy your possessions instead of struggling with them. It really will be easier for you to maintain that level of organization. If your household is managed well and running more smoothly, you can spend your time and energy on what you really want to do! Professional Organizers design systems and processes based on established organizing principles. And, we teach you how to use them. Whether you need motivation with decluttering, or finding a better system for managing your belongings, or using your existing storage spaces in new, creative, and more efficient ways, I can help. I like the saying, “Creativity is intelligence having fun.” I have so much fun making my clients’ houses more enjoyable to live in. Do you wish that you could get dressed faster in the morning? Do your closets have wasted space in some areas, and not enough in others? Is it time to weed out those clothes you’re not wearing? Do you have an avalanche of Tupperware containers and lids in your cabinets? Do you keep buying more brown sugar because you don’t know how much you have? If you need your lasagna pan or meat thermometer, do you know where they are? Are you unable to pull your car into your garage? Do you have trouble finding a screwdriver when you need one? Do you wish that your sports equipment or garden tools were more accessible? Are there piles of papers on your dining room table? Could a piece of incoming mail possibly be found in several different places? Can you find printer cartridges or other office supplies when you need them? Do you have to search for what you need when you leave the house? For laundry, do you know which clothes are clean and which are dirty? Are your hobby supplies in several different rooms of the house? For some kind comments from my wonderful, happy clients, please see my Raves page. My hourly rate is $80. Most often, a 3 hour minimum block of time is needed so that we can get some organizing accomplished and you can see some results. I can also give you homework between sessions if you’d like to accelerate the process! 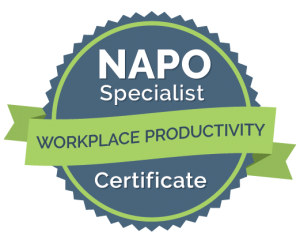 I am proud to be a member of NAPO, the National Association of Productivity and Organizing Professionals, and NAPO-Austin. 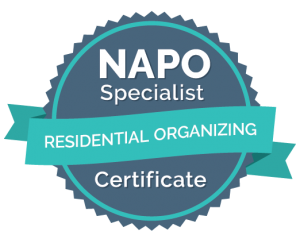 When you hire a NAPO member like myself, you are hiring a skilled consultant with access to professional education and experience with the best organizing skills, strategies, and products. 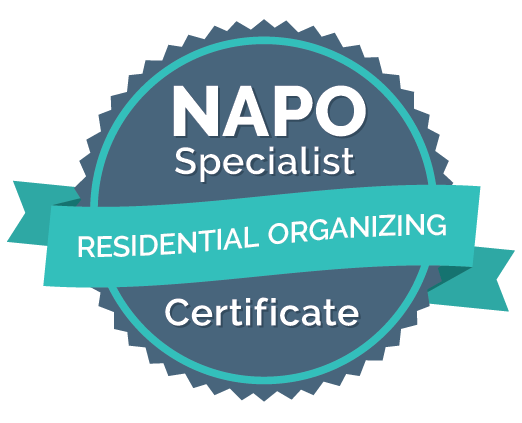 I hold a NAPO Specialist Certificate in Residential Organizing. I also hold a NAPO Specialist Certificate in Workplace Productivity. I follow the NAPO Code of Ethics, which means that all of my work with you is kept in strict confidentiality. You can trust that I will handle your belongings with respect, care, and discretion. For more information about my policies, please see my FAQ page. My clients are in Austin, TX and the surrounding areas, including Lakeway, Westlake Hills, Rollingwood, Sunset Valley, Oak Hill, Bee Cave, Spicewood, Cedar Park, Round Rock, Pflugerville, and Georgetown. See my Frequently Asked Questions (FAQ) page for questions not answered here.